If you spend much time at all in Polish cities, you’ll see folks walking around eating long skinny Zapiekanka Polish French Bread Pizza. They always look and smell terrific. Almost two years after my first visit to Poznan, curiosity got the better of me. As I was leaving Sweet Surrender one afternoon, rather than hop on my tram at Most Teatralny, I walked over to another corner of this busy intersection to order my first Zapiekanka. Zapiekanka dates back to the 1970s, and the small amount of free enterprise allowed by the Communist government, mała gastronomia, travel trailers or food trucks serving simple street food. Zapiekanka’s base is a baguette, cut in half lengthwise. Traditionally, it’s topped with mushrooms, melted cheese and on the very top, a squirt of ketchup. With food scarcity a thing of the past, Zapiekanka now comes with mind boggling topping choices. I think my first was kebab meat. 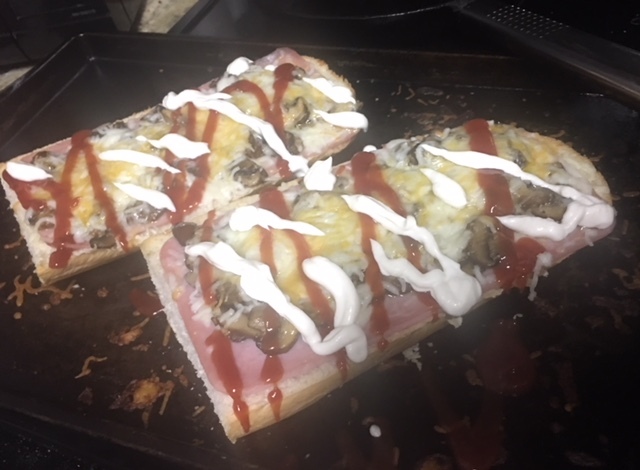 The ones we made at home recently, had a slice of ham, sauteed mushrooms, cheese, and were topped with ketchup and everyone’s favorite garlic sauce, sos czosnkowy. I made my own garlic sauce which is so versatile. You’ll find so many ways to use it! Ed pronounced it very Polish tasting and the perfect finishing touch. My prescribed recipe below is very basic, add to it as you choose just be sure to keep the melted cheese and sauces on top. For protein, you might try BBQed meat, cooked bacon, or salami. As you saute the sliced mushrooms, maybe you’d like to toss in some sliced onion or bell pepper. As for the cheese, make it something that will melt well, cheddar, mozzarella, even Oscypek if you’re lucky enough to have some. To be authentic, add a squirt of ketchup on top of your Zapiekanka as it comes out of the oven, and any other sauce you like, garlic sauce, ranch, or 1000 island dressing. The amounts listed below are really just guidelines, like sandwich, soup, or pizza making, the rules aren’t so strict. I look forward to hearing what toppings you’ve put together. We thought our homemade Zapiekanka were delicious! PS – this explains why Poles are likely to put ketchup on pizza, even though it already has a red sauce! Poland’s colorful and delicioius street food! Previous Post: « Flaki Polish Tripe Soup — a Hangover Cure! Nice way to use up bits and pieces of veggies, cheese, etc. Thanks Lois. Happy New Year. Thanks, Elizabeth; Happy New Year to you too! 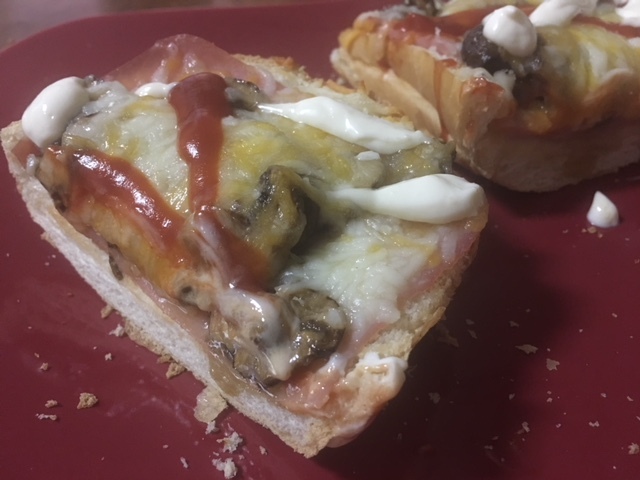 i think I will stick with French bread pizza from lean cuisine. that stuff looked quite mixed up to me. to each his own, though. I’ve heard a lot about these but never felt that ketchup, since it is so sweet, is a good topping. But to each their own. I love how Poles put mushrooms on everything. They must have a prodigious mushroom growing industry there. My mom remembers her elders going mushroom hunting near Chicago and drying the shrooms on lines of thread hung up around the room. Mushrooms go into almost everything in PL! The environment is just right for them, lots of forest, lots of damp weather. It seems like every family has an expert in identification who leads their mushroom gathering expeditions. My mother made something like this when we were kids. Definitely different flavors, but we loved it as a special treat! Certainly more fun than fish sticks! What different flavors of cheese have you tried on these? I have used cheddar and mozzarella.